1. Introduction - In this paper, we analyze the value of money. We consider both paper money and gold. 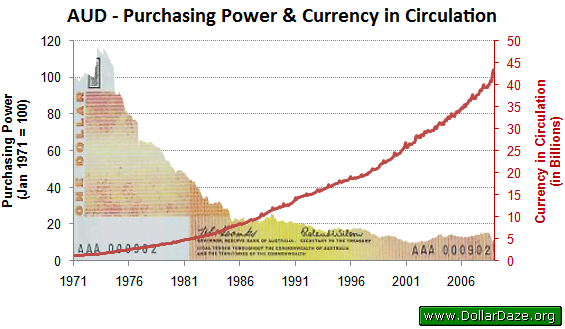 We attempt to relate the supply of money (MS) and gold to their purchasing power (PP). We demonstrate the extent to which printing of money dilutes its value. As a store of value, the value of money is represented by its purchasing power. We compare the ability of paper money and gold to function as a long-term store of value. We conclude that gold is an excellent store of value, while paper money is not. We observe that excessive printing of paper money is the ultimate cause for the inability of paper money to function appropriately as a store of value. Historical monetary data is readily available on the internet. The official source is the Federal Reserve Board. Its monetary aggregate data can be found on its web site and is available free of charge. The Bureau of Labor Statistics (BLS) publishes the historical Consumer Price Index (CPI) data. Like the Fed, it also publishes the data on its web site and makes it freely available. For a proxy of the purchasing power of money, we use the inverse of the consumer price index. 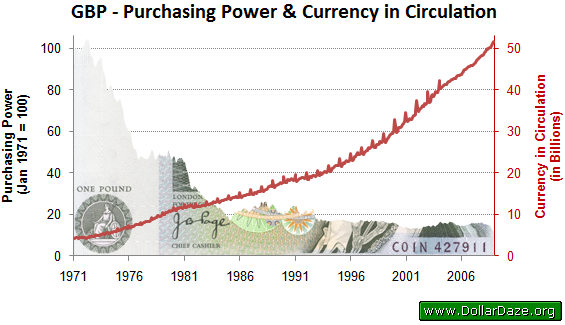 To illustrate, if the price index doubles, the purchasing power is halved; if the price index increases 10 times, then purchasing power of money falls 90%. The following chart shows together the data taken from the above two sources. 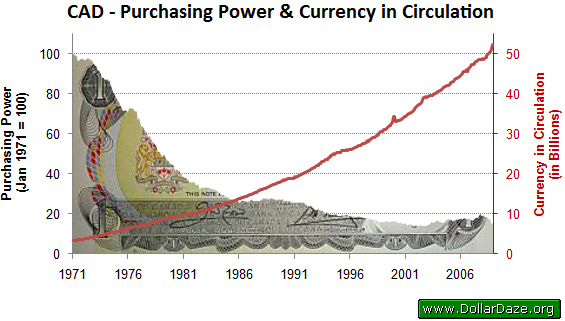 The chart visually shows the near-perfect inverse relationship between the amount of money in circulation and its purchasing power. It reflects the simple relationship that prices increase approximately proportionately to money supply. Stated differently, it reflects the basic tenet of monetarism that in the long-run, price inflation is a direct consequence of increase to monetary inflation. It also underlies the classical theory of "money neutrality"; whether one believes that money is "neutral" or not is a completely different story. Looking at the data, from January 1971 to December 2008, the U.S. money supply increased 16.8 times; this was accompanied by an 81.1% drop in purchasing power of the dollar, as implied by the governmentally-reported CPI. Thus, the data suggests that a 17-time increase in money supply has resulted in an approximately five-time fall in purchasing power. We do not attempt to explain this significant gap, but mention that the gap may be due to (1) increases in productivity, (2) over-reported money supply, (3) under-reported CPI, (4) over-valued asset prices (stocks, bonds, real estate), or possibly (5) a fundamental flaw in the quantity theory of money. We would suggest, in order of significance, (3), (4), and (1) as the most important factors explaining the gap. The United States is not alone in pursuing inflationary monetary policy and steadily inflating its money supply. 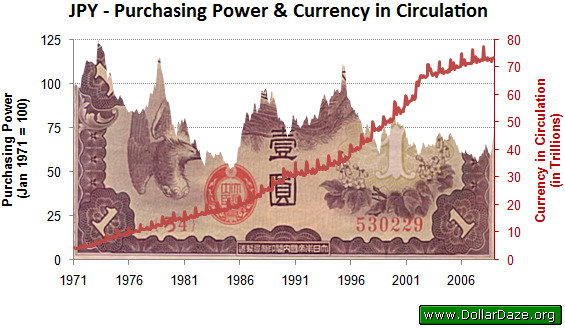 Available historical exchange rate and money supply data permit similar analyses for other major currencies. We provide a similar analysis for (1) the British Pound, (2) the Canadian Dollar, (3) the Australian Dollar, (4) the Japanese Yen, and (5) the Swiss Franc for the same period (1971-2008). We chose 1971 as a starting point for three reasons. First, prior to 1971 exchange rates were fixed, Second, pre-1971 exchange rate data is difficult to obtain. 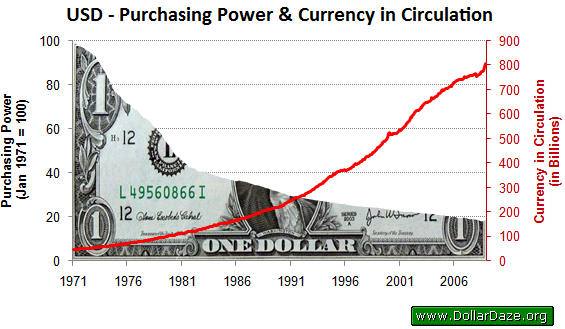 Finally, prior to 1971 the dollar was fixed (convertible) to gold. On the other hand, after 1971, exchange rates were floating, data is available, and the dollar floated against gold. In other words, we chose the post-Bretton-Woods period. Bretton Woods is the period that characterizes the international monetary regime between WWII and 1971. After the Second World War, only the U.S. Dollar remained convertible to gold at a rate of US$35 per troy ounce. During that period all other currencies were linked to the dollar at a fixed exchange rate. On August 15, 1971, President Nixon unilaterally closed the 'gold window' to prevent foreigners from exchanging their U.S. Dollars for gold. 1 Thus, he terminated the convertibility of the dollar to gold and allowed the dollar to float against gold. This was done likely to prevent the complete loss of the U.S. gold reserves. In turn, other currencies began to float against the U.S. dollar. Since that historic moment, for nearly 38 years all currencies in the world have not been backed by any tangible asset. It is an unprecedented monetary experiment that extends to the entire world and involves every living person. The next three charts show similar relationships for the British Pound, The Canadian Dollar, and the Australian Dollar. Interestingly enough, the remaining two currencies - the Japanese Yen and the Swiss Franc - displayed greater resilency to monetary inflation and depreciation. This is especially true for the Swiss Franc - the amount of Swiss Francs in circulation increased a relatively modest 280% over the same period. The explanation may lie in the fact that even though the Swiss Franc has not been technically (legally) convertible to gold, the Swiss Central Bank has attempted to maintain proper gold backing of the Franc, which in turn, had the effect of moderating inflation. Before 1971, gold was always used as a basis for money. It is generally accepted that gold has functioned well as a store of value and has maintained its purchasing power for over 5000 years. 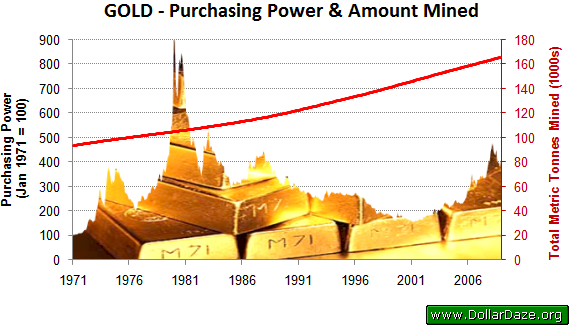 So, what can we say about the supply of gold and its purchasing power for the period of 1971-2008? How does gold compare as a store of value (purchasing power) against other major currencies for the same period? For the supply of gold, we use data from the U.S. Geological Survey (USGS) and the World Gold Council (WGC). USGS maintains records of supply-demand statistics for a variety of minerals and metals, including gold , going back to 1900. The WGC estimates that a total of 165,547 tonnes of gold have been mined, including 2,400 metric tonnes for 2008. Combining the two data sets, we infer that for the period of 1971-2008, gold supply increased from 93,515 metric tonnes of gold to 165,948; thus, for the whole period, gold supply increased by merely 78%. For the same period and using the same CPI statistics, the purchasing power of gold has actually increased four times. The price of gold is up from about $38 to about $822, which corresponds to an increase in its price of almost 22 times, while the CPI is up from about 40 to 210, or about 5 times. Thus, for the period, the price of gold has increased about 22 times, while the price level has increased about five times, resulting in an increase in the purchasing power of gold of about four times; the exact increase is 310%, which corresponds to purchasing power of a little over four times. The numbers are shown on the graph below. So, what can we conclude from this whole analysis? The overall conclusion is that gold is a significantly better store of value than paper currencies. While the purchasing power of gold is up four times, the purchasing power of major currencies is down 5-10 times, except for the Swiss Franc and the Japanese Yen, whose depreciation is significantly less. The second column in the table below, Change in Unit Value , shows the exact percentages. The explanation for gold's ability to hold its purchasing power is obvious from the first column. While the supply of gold has not even doubled for the period, the supply of some currencies has increased 10-20-30 times and more. For example, the supply of Australian dollars increased 33.5 times, while the supply of Canadian Dollars is up 15.4 times. There should be no wonder why they have lost most of their value for the period. If governments print them fast, they will depreciate rapidly - it is as simple as that. Governments can't print gold, so they can't depreciate its value. In the world of money, gold is still the best store of value. 1 It was illegal for Americans to own gold for investment purposes since President Roosevelt signed Executive Order 6102 on April 5, 1933. It wasn't until Dec 31, 1974 when Americans could once again own gold coins, bars and certificates. It is this looming crisis that central banks are starting to accumulate gold. The US is the largest holder of gold with some 8,100 tons worth at todays price, that touches about US$980 per ounce, around US$270 trillion. China has increased its gold holding since 2003 to 600 tons from about 454 tons, and want these to rise by another 4,000 tons. Russia has been buying roughly four tons a month. Yet these gold purchases as seen in the case of China is that most are internal so as not to drive up the price of gold that already has been increasing. Behind all this the IMF hopes to sell its 405 tons of gold stock. However the silent gold trade central banks follows patterns like money in which it can be borrow or loan out, while they hold paper gold certificates, much like treasury bills. Gold paper also acts on the gold futures market like derivatives, that are usually cashed in for US dollars. The problem is that if the US dollar collapses, then the demand for physical gold as payment rather than a US dollar is bound to send the price of gold upwards at an horrific rate. Like derivatives, gold trading in loans between central banks is off the books and very few banks record it, much like what was noted in the 2009 crisis concerning derivatives. The questions that are haunting global trade are that does the US really have 8,100 tons of physical gold to cover its loans or is a good amount of it gold paper? Although the gold option for central banks appears as a sound policy, it can collapse if the US decides to sell huge amounts of gold causing the price to fall. What then would happen to the Chinese policy to get away from a faulty US dollar by buying gold and then the US causes gold prices to collapse? As the US is the largest debtor nation, borrowing in excess of 80 percent of the world's net savings just to pay daily bills, central banks are concerned that the US may never pay back its creditors, and the selling of gold to pay its debts is the option that the US has as seen in the 1950s. The US may be down, but its not out, it can if it has the its physical gold reserves to cut through the crisis but it would bring its economy and the US dollar back to square one. Instead of it going back to square one it can shift liabilities over to other countries and those countries go back and beyond square one to minus one. Consequently the fear of a drastic fall in the US dollar, as a result of this debt, saw former People's Bank of China top economic policy maker Yu Yongding indicate that China has to sell its huge US$1 trillion plus reserves and buy gold to protect the Chinese economy from ruin, appears a sound policy but it depends on how the US reacts. Silently the Chinese central bank has been buying locally produced gold so as to avoid driving the international price of gold up. Yet if the US does have the physical gold and does decide to sell to clear its debts what then would be the price of gold that could well tumble, thus affecting gold holdings? This lose-lose situation for China, Japan etc and in particularly the G-20 is what is driving the G-20 meetings to find a solution to keep the wealth within that club while transferring liabilities to other nations as was the case for Zambia in the 1970s and the Sterling 1949 crisis. If the USA does have 8,100 tons of gold which I doubt as per GATA's findings then the actual number is only 270 Billon not trilion. Hardly enough to jump start a new gold back currency. They would have to revalue gold much higher to pay off its debts. Very interesting times we live in!